Ok, so I know my pictures aren’t that good. 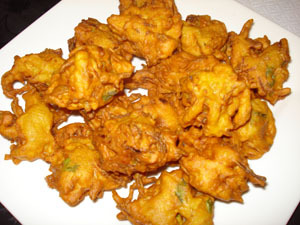 But these fritters are delish! I made them after feeling a bit guilty for my hubby. He ate leftovers over and over and over since I’ve been on a steady diet of weetabix since I got my wisdom teeth extracted. To cheer up his last day of eating leftovers (and to celebrate that they were actually over!) 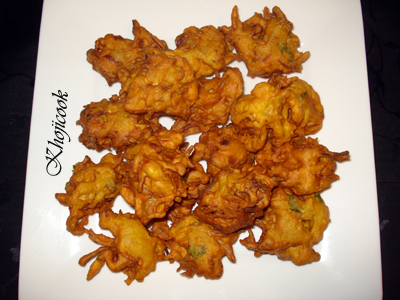 I made these yummy fritters. They turned out so good, I made my sister a batch and she said they were good, and that is a major compliment for me since she is a seasoned cook! Give them a try, they are easy to make and need no special skills. All cup measurements are made using a regular liquid measuring cup. 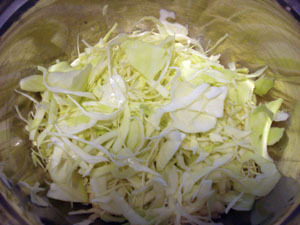 If using a food processor, use the slice blade to slice the onions and cabbage. 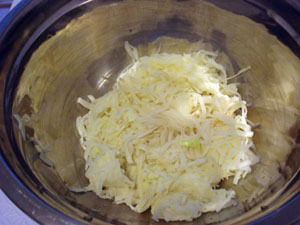 Use the ‘shredder’ plate to shred the peeled potatoes. 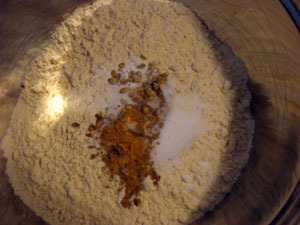 Mix together the chickpea flour, baking soda and spices. Add all the vegetables, cilantro, lemon juice and garlic paste. Mix well to coat all the vegetables with the flour mixture. 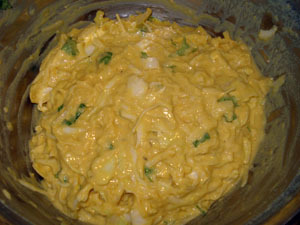 Add approximately 3/4 cup water to make a thick batter. Using your hands is the best way to ensure all the ingredients are mixed well. Heat a wok/kadai with 1-1.25 inches or more of oil on medium high heat. 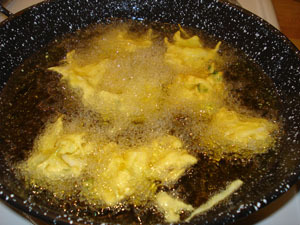 To test the oil, put a drop of the batter into the oil, it should float pretty quickly but not turn brown immediately. If it does, the oil is too hot, reduce the heat. 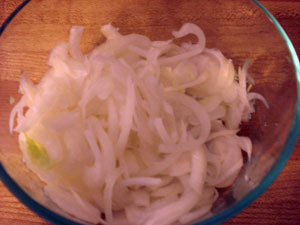 Using your hands, take about a tablespoon worth of mixture and drop into the hot oil. Don’t overcrowd the pan. It should take 3-5 minutes for each batch to turn golden brown. If yours turn brown earlier, it is possible the heat is too high. Use a fork to turn the fritters. They don’t need to be neat. The poky parts are usually the most crisp! Best eaten fresh and hot. Serve with your favorite chutneys. Enjoy!